Cannondale launched the Habit 27.5 a few summers ago as a fun and playful trail bike. It sported Cannondale’s proprietary Lefty fork and a comfortable geometry with 120mm of travel. This year, Cannondale launched a revamped FS-i and Lefty Ocho for its cross-country following but had an extra card to play. The Habit 29 is for the everyday trail rider looking for something capable and durable. This new platform has an updated suspension design, updated geometry, and a little extra travel with 29-inch wheels. We are fans of trail bikes in this suspension category and were eager to put in some miles on this beast. The Habit 29 was designed for the everyday rider looking for something that climbs well and descends well. With prices ranging from $2000 for an entry-level aluminum model to $7500 for the highest-end carbon, Cannondale hits every major price point to appeal to a broad range of riders. 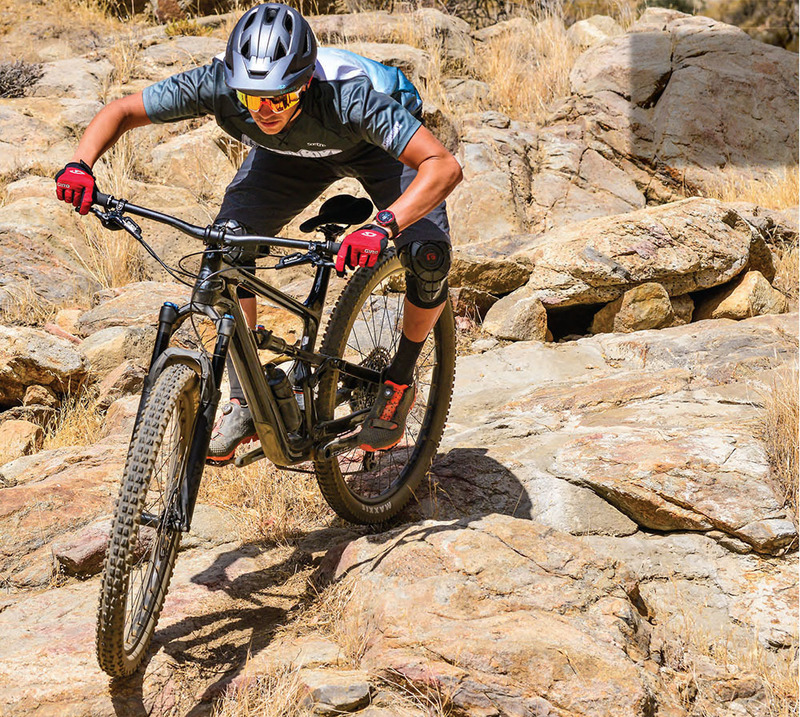 Cannondale has been known for pushing the boundaries of frame and suspension design with components like its Lefty Ocho. The Habit 29 has plenty of engineering designed into the frame, but it is a bit simpler than other models. Cannondale offers three frame levels: the entry-level aluminum, a carbon main frame with an alloy rear triangle, and the high-end full-carbon frame and rear triangle. Our test bike has a carbon front triangle and an alloy rear with fully internal cable routing. Cannondale uses internal guides to make routing the cables a simple and headache-free process. The rear triangle uses Boost spacing with Cannondale’s Ai offset that pushes the drivetrain over 3mm to allow for more tire clearance and shorter chainstays. While the bike was designed around 29-inch wheels, it is plus-size compatible on a 27.5-inch rim. The previous 27.5 version of the Habit used a single-pivot suspension design. For the 29er build, Cannondale moved to a Horst-Link with a flip chip that adjusts the head tube angle by half a degree. The Habit 29 has 130mm of rear travel with a 130mm fork. At the heart of the Habit 29 is a design dubbed Proportional Response. Cannondale invested a lot of time and effort into determining the various centers of gravity a rider will experience on the bike. During its testing, Cannondale determined that riders will experience 10 different centers of gravity; five when climbing and five when descending. This helped Cannondale determine the finer points of the geometry and even the shock placement across all frame sizes. Our test bike hits a sweet spot with a price tag of $3800. 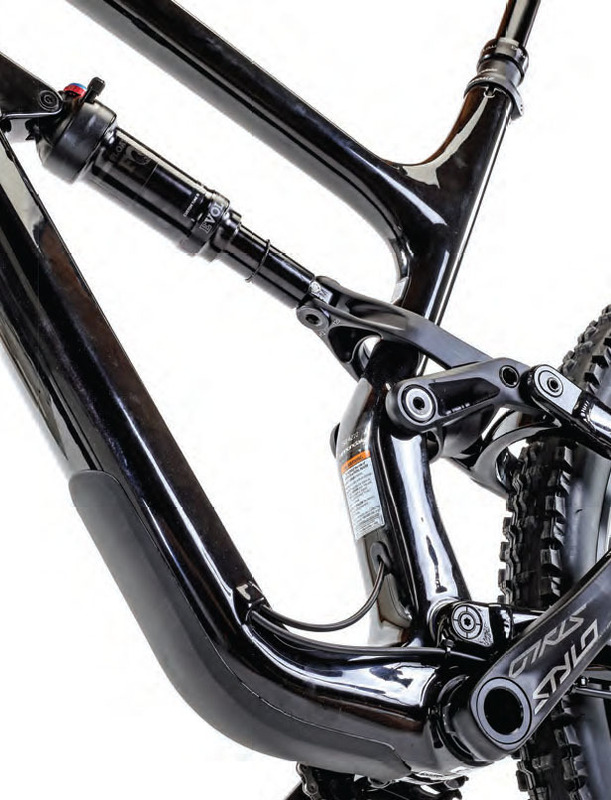 It has a carbon fiber frame, Fox Performance suspension and a SRAM Eagle NX drivetrain. The Fox Performance suspension is similar to the higher-end Factory versions but without the steep price tag. SRAM’s NX Eagle drivetrain provided consistent shifting and a wide gear range with the 32-tooth front chainring. This is the first test bike we have ridden with Cannondale’s new DownLow dropper post. The post worked well and didn’t give us any issues during our testing. Setting sag: Cannondale designed the Habit 29 to be run with 12mm of SAG—essentially 30 percent. We aired up the shock to the proper air pressure and set the rebound for our higher-speed trails. Up front, we ran the Fox 34 fork with 20 percent sag and two volume reducers for a little extra support at the end of the stroke. Moving out: The Habit 29 has a progressive geometry with a longer reach and steeper seat tube angle. Our test bike came stock with a short 50mm stem and 780mm-wide bars to fit the needs of modern trail geometry. Climbing: As we pedaled up the first fire road, the Habit gave us an efficient platform, especially with the shock switched into the middle position. Climbing up technical sections of the trail, the rear suspension was supported but still allowed for traction. The front end could be easily maneuvered over rocks and up steep pitches. Cannondale endeavored to make the frame as stiff as possible, and it was noticeable when pedaling out of the saddle. The head tube didn’t give us any unwanted flex. Similar to the shock, we ran the fork in the middle setting when climbing, just for a little extra traction. Descending: With the suspension open, it didn’t take us long to feel comfortable ripping downhill on the Habit. The rear suspension was active, had a very linear feel through the travel, and tracked confidently through technical chunder. We pushed the Habit hard to find its limits but were constantly surprised by how capable it felt with 130mm of travel. The Habit 29 was balanced and stable. Cornering: The playful qualities of the Habit carried over into the corners. The Maxxis Minion DHF front tire is one of the best in terms of cornering grip, and it added to the overall abilities of the Habit. The balanced feel of the Habit was evident when we leaned the bike over, and the rear suspension tracked well with the proper rebound settings. Some of our more aggressive test riders opted for a small volume reducer in the shock for a more progressive feel near the end of the stroke. While the stock setup will feel comfortable for most, more experienced riders will appreciate a little extra support. The stock setup on the Habit is ready to go, but with the carbon frame and Fox suspension, the bones are good enough that riders could upgrade key components, such as the wheels and drivetrain, to save some weight.